Using an existing badge card (“Mango” badge type) or a key fob will simplify employee timekeeping. 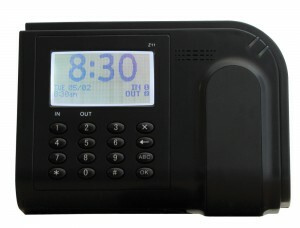 In addition, some solutions allow you to unify your building security access with the timekeeping directly. The FlexClock Z11 offers employers an affordable near real-time timekeeping solution (Ethernet- enabled) that also offers the ability to use an employee proximity badge card for recording in/out punches. 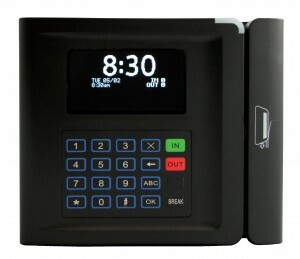 The FlexClock Z14 is a practical timekeeping solution that offers employers valuable labor management technologies through two device options, including a proximity-based unit or magnetic stripe card reader. 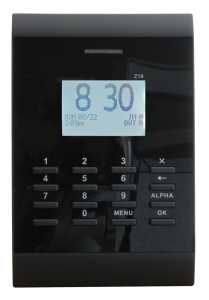 The FlexClock Z18 delivers superior value and features with its integration of timekeeping and universal proximity badge card access. It connects to the Web in near real-time (Ethernet) and offers additional value in its ability to support a “bell chime” and biometric employee identification with PrintReader.